HOW DO THE DRINKS ON VIKING WORK? Q – We are set to sail on Viking next summer and we could not be more excited. Our travel agent felt we were right for Viking because we’re kind of conservative mid-westerners and, although we drink, we don’t like the idea of paying for other people’s drinks on the boats where the liquor and beer is free-flowing all the time. Those cruises sound more like party cruises when we’re more interested in the history and culture. But we are wondering exactly how the wine/beer situation on Viking works. As the largest, most successful line, I would imagine they have things pretty well worked out? A – Yes, you are so right. Those river cruises on Crystal, Scenic, and especially Tauck are all drunken bacchanals. People are regularly passing out on the decks because the liquor and wine is included – for free! You just have to step over them. And the parties – fugettaboutit. You are going to be much better off being nickel and dimed for every drink you take outside of dining hours. Actually, Viking has a reasonable drink policy. Beer and wine is included at lunch and dinner and during certain shipboard events and tastings. Now you can;t order unlimited cocktails and the wines offered may not score 90+ on Wine Spectator, but they will be a nice accompaniment to your food. At other times, wine, beer, and cocktails are available for sale at prices that are close to what you would pay in a nice restaurant at home. Some guests on Viking (from the evil drinking states along the east and west coasts) order Viking’s Silver Spirits package which offers unlimited drinks at all hours. The general rule of thumb on this kind of package is that it makes financial sense of Mr; and Mrs. will be ordering 8-10 bar drinks per day outside of inclusive drinks meal hours. You will see some of your fellow guests purchasing drink items ashore and keeping the necessities in their in-room fridge. This is considered the very definition of class. 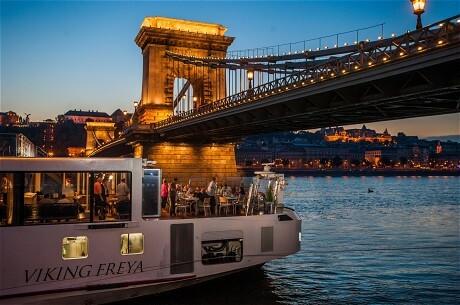 The notion that an all-inclusive river cruise means you are paying for other people’s drinks has some validity but, in the scheme of things, it really means that one more on-board “spend center” is eliminated and must be included in the fare. That can also include gratuities, as well as shore excursions that are often sold at additional cost despite the line’s promise to include shore excursions. The top three lines in our ratings, for instance, do not even offer more expensive, additional cost tour options. The non-inclusive lines like Viking do. With all these “spend centers” removed, the top three or four lines must charge significantly more than the bottom three or four lines in the ratings. Finally, we would point out that you seem to be looking for a better-educated more well-mannered fellow guest ratio. That is hard to talk about in print but it comes up often. The fact is that the more expensive lines attract a different core clientele than the entry-level, river boat lines with add-on, a la carte pricing practices. We want you to be excited about your cruise and we think you are going to love Viking. Their ships are beautiful.